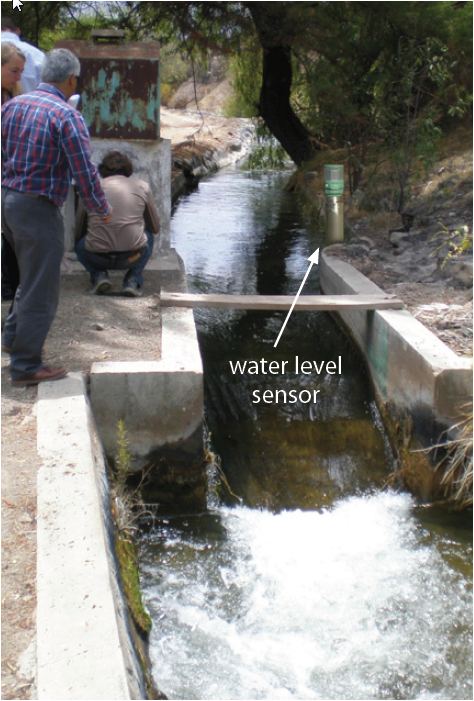 The SEBA-ribeka system is a comprehensive water resource information, monitoring and management system. It is an end-to-end solution for all • Regantes • Canalistas • Celadores • Juntas and • Asociaciónes. 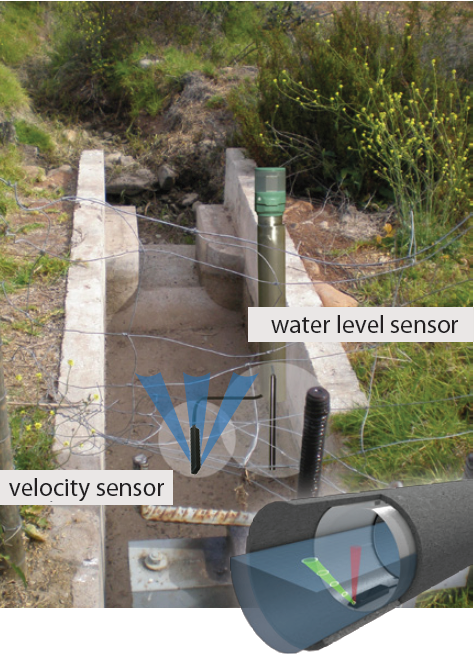 It provides intelligent and sophisticated methods for quantifiction and monitoring of water resources and uses, nevertheless provides a user-friendly and convenient display of all assessed information resulting in a comprehensive integrated information system for water resources management.The system is comprised of the following parts: • Specialized water level, water velocity, discharge and water quality runoff sensor• A data logging, data transmission (GSM/GPRS) and alarm system• A seamlessly integrated, modular software system for data management and evaluation. 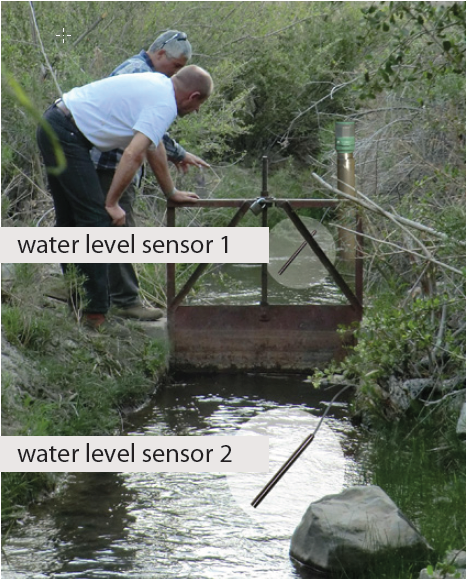 In basic monitoring systems, the discharge is measured and recorded by standalone, non-telemetered instruments for instance with a SEBA UniLog V data logging system. 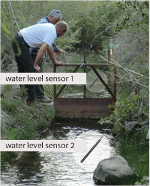 This option is suitable for case scenarios with manually-operated irrigation gates and a periodical download of discharge data for documentation and proof obligations. Considerably more advanced systems are automatic, telemetered systems with internet connection. quota. If the measured discharge rate differs from this quota, the gate controller can directly adjust the gate opening in order to re-adapt it. Since the SEBA-ribeka system is internet-capable it enables the user to monitor the current system status. The possibility to monitor device activity and measurement data via the Internet is saving time and reduces operational costs. 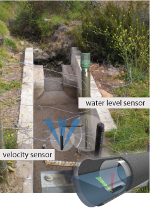 Automatic telemetric data transfer from the measurement device to the SEBA-ribeka server is possible at every location with adequate cellular or satellite coverage. 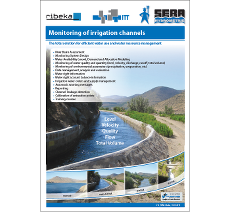 The SEBA-ribeka solution provides a direct access to your irrigation monitoring system. You can check its current status at any time by viewing data from all telemetered devices via a secure access on the internet. Next to a web-browser-based solution for your desktop computer additional Apps for Android™ based Smartphones are able to provide a mobile view of the current discharge/flw and, if available, gate control status. In case of measured threshold exceedances and possible device malfunctions, telemetered devices can additionally send alarm messages via SMS or email to predefined recipients or recipient groups. The PC-based application as well as the dedicated comprehensive and centralized database are the core components of the software system. 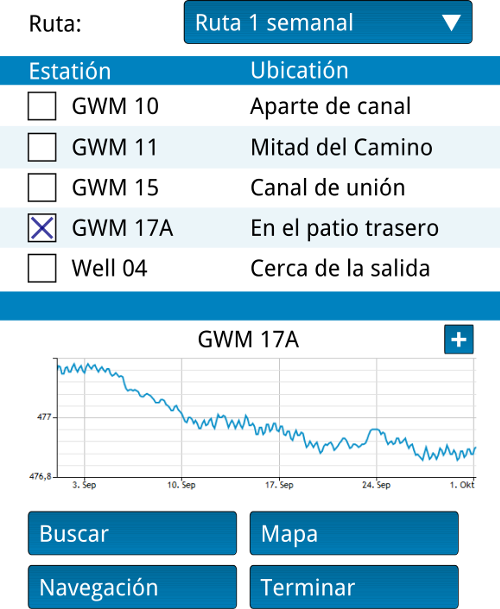 The PC application is based on the Water Monitoring and Management System GW-Base. This professional and efficient system offers comprehensive and user-friendly possibilities to manage and evaluate all accumulated data like environmental data, climate data as well as ground and surface water data. A special feature is its capability to additionally manage and evaluate irrigation (and land use) data , water rights information and water rights account balances.The corresponding web and smartphone modules, which also access the central database serve as data viewers and, with regard to the smartphone apps, as specialized data providers. map backgrounds and features, next to raw data display, the display of photos and images, statistics, graphical evaluations, and reports. 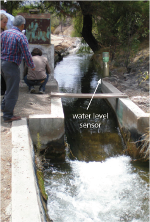 In particular it will be possible, next to the data export from GW-Base, to process and display real time data deriving from the installed sensors and data loggers (water level, velocity, runoff, discharge, precipitation etc. in channels, reservoirs, and rivers). 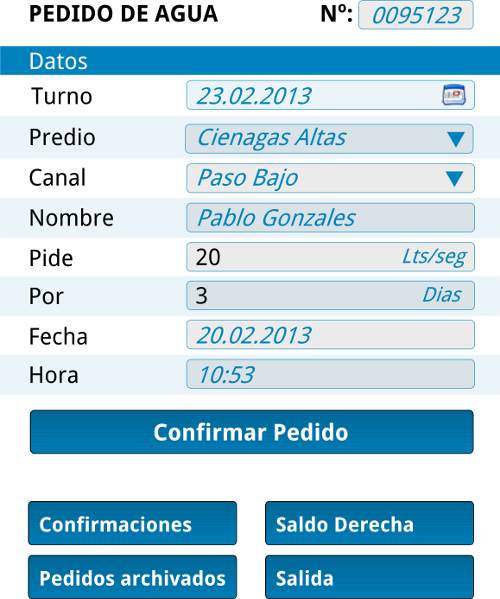 The smartphone application modules are specialized to different tasks and fields of application. These Apps are available for Android™ devices as well as for iPhone®. All apps are able to access the same central database, which is also used by the web modules. The fieldof application ranges from simple display of public information to advanced display and provision of restricted data. Hence, all data managed in the central database can potentially be displayed and complemented, starting from environmental and water resource information to water right, water right account balance and irrigation water orders and supply information. A user-friendly and convenient application handling which is adapted to the needs and requirements of the specific user groups was in a special focus during development. GW-Base, respecively the dedicated central and comprehensive database is capable of storing all data relevant for the water administration sector. This data can derive from various sources and can be maintained in several different ways. Next to manual data adding, the import of data from external databases and from miscellaneous sources like (spreadsheets, tables, data files),the most convenient way is the import of data of logger data from the installed sensor network. 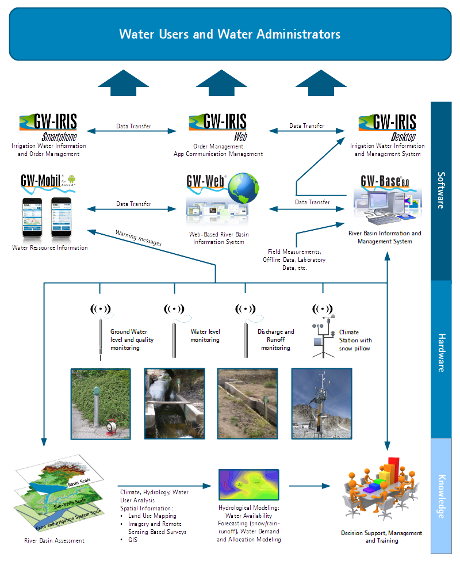 For the first time, a fully integrated monitoring and management system is available, which consists of perfectly concerted hardware and software solutions and which provides the possibility of comprehensively monitoring, managing and evaluating all data relevant in the water management sector.